10% off food and drink purchased from our theatre bars (excluding Restaurant Hibiscus and John Franklins’ bar on Guildhall Road). Single membership costs £30 per annum (eligible for two discounted tickets per show). Joint membership costs £40 per annum (eligible for four discounted tickets per show). To purchase a membership as a gift for someone else, call Box Office on 01604 624811, or visit us in person. Gold Membership costs £150 per person, per year and includes a donation to the theatre. 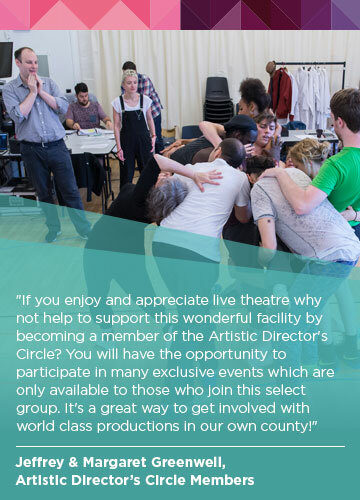 Join our patronage circle; share our passion, gain an insight into our work and develop a deeper understanding of how we produce theatre of the highest quality. Single Artistic Director’s Circle membership costs £600 per year. Joint membership costs £1000 per year. Your contribution directly funds the shows we produce at Royal & Derngate as part of our made in Northampton season.